Taliesin and Sam, the Dino Boyz: building diorama at the Smithsonian. As a young person in the fifties and sixties I had Marx, MPC, TimMee, Nabisco, Tootsie Toy and Ajax dinosaurs. I seem to have missed the Miller and Sinclair toys somehow. A favorite of mine was the Aurora Stegosaurus with cavemen that my father bought for me. My other favorite was the Marx Flintstone play set from my grandfather. My interests lapsed as a teen, although I did a science/art project that would now be called a Paleo art project in Jr. High where I drew prehistoric scenes from the Cambrian to the Pleistocene and posted them each week. In 1989, I came to live is Washington DC and was exposed to the Smithsonian Natural History Museums Dinosaur exhibits. 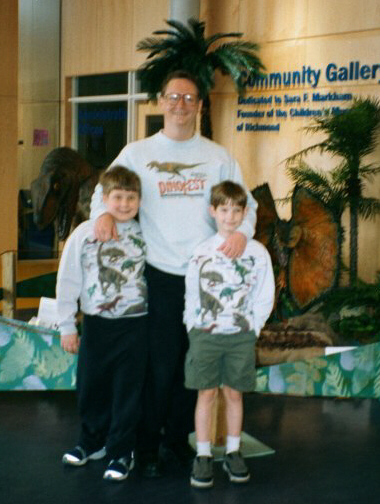 My favorites were the three dinosaur dioramas and it started my collecting of Safari figures from the gift shop there. After Jurassic Park came out I expanded my collection to include many of the new toy lines. I came across an ad for a magazine call Prehistoric Times and subscribed. I learned more about other toys lines from articles in the magazine and communicating with other collectors. I wrote a few articles for them and I briefly collaborated with the Dinosaur Galaxy Gazette reviewing new releases of dinosaur toys. My style of writing didn't fit into the lighter format that they wanted for a reviewer. I started up my own Dinosaur Web site on AOL to show my collection off. Eventually I filled up my AOL site and started Site A at the 150m.com site. This gave me more hard drive space for graphics and allowed me to begin using MS Front Page for the new pages. Recently I upgraded the site to be popup-free and have a replaced my old Digital Casio camera with a Minolta for higher resolution. I originally intended to post photos of my dinosaur dioramas with a light commentary. I consider my first successful effort to be the Morrison page, which is largely unchanged. It remains my personal favorite. As time went on I got requests for more detailed pictures of the individual figures. Much of the work over the last few years has been trying out different ways off combining the wide-angle diorama shot with more detailed pictures requested by figure enthusiasts. Some techniques have been more successful than others. I try to keep a log of my changes in the Updates page. I discovered Ebay and eventually added a News Page to show off things I had found but had not yet put into dioramas. This eventually caused me to create the Reference Pages, based on the one I saw at the Rubber Dinosaur Site. I liked the format and wanted to add more details. Some of the conventions I use have started showing up in the descriptions of auctions on Ebay and I hope sellers who want to describe their offerings continue to fine it helpful. In 2001, I started doing a regular column for the Prehistoric Times primarily devoted to new toy releases. I do try to sneak in references to older toy lines and some paleo-facts. I enjoy hearing from site visitors, PT readers and showing off my collection. Smithsonian Summer Camp Dinosaurs and Dioramas. DC (Dinosaur Collector) staff have been introducing kids to dinosaurs for several years. Mon.–Fri., 9:30 a.m. to 4:30 p.m.
Pelorosaurus, Craterosaurus Hylaeosaurus, and Yaverlandia are dinosuars of the Mesozoic period in Laurasia. Campers discover the animals and plants of Asia, Europe, and North America by completing a diorama board, painting a figure for Dinosaur Safari, and turining old CDs into a swamp, forest, or scrub terrain to take home. Through field trips, game stimulations, documentaries, and stories, campers are introduced to plate tectonics, species variation, and different plant types. Attention, future paleontologists! Sauropelta, Spinosaurus, Muttaburrasaurus, and Minmi are just some of the dinosaurs campers meet as they explore the Early Cretaceous period of Gondwanaland. They’ll learn about the Mesozoic animals and plants of Africa, South America, India, Australia and Antarctica. They will be introduced to plate tectonics, species variation, and plant types through field trips, game simulations, documentaries, and discussion. 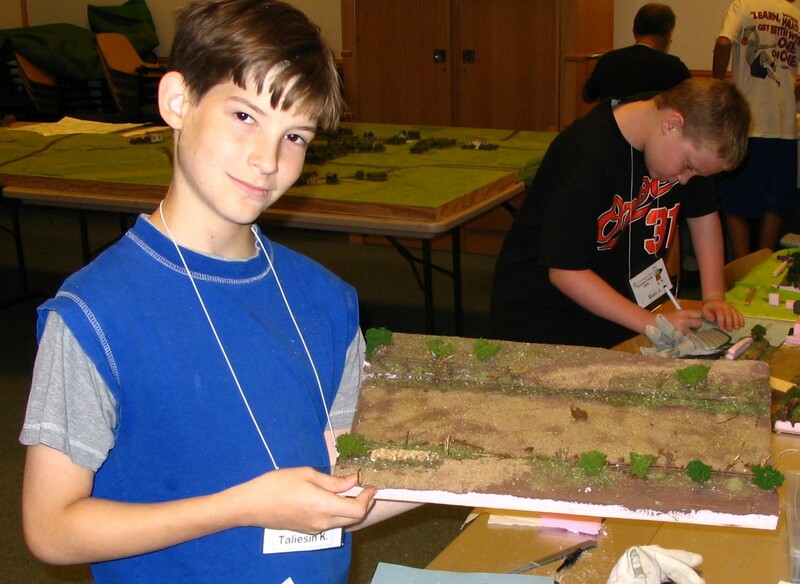 Campers complete a diorama board, paint a figure for Dinosaur Safari and use old CDs to create a swamp, forest, or scrub terrain to take home. They also visit the Natural History Museum’s Dinosaur Hall and the Botanical Garden for inspiration. They no longer want to be velociraptors when they grow up but are still full enthusiasm. The “twins” play test all our products quite rigorously. 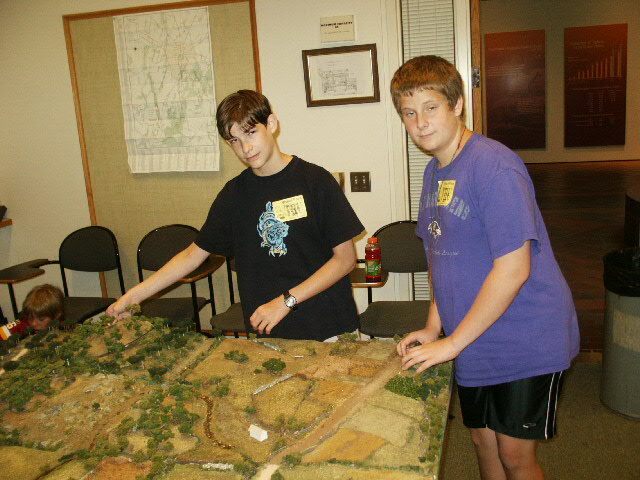 They teach the Smithsonian Diorama camps and bringback with many new ideas. They provide a fresh and unrestrained point of view of the different toys we look at. They make the whole project fun. We have good times. We have benefited from the help of Sean D. Bell; Masters' student (vertebrate paleontology) University of Saskatchewan, Canada. He is the real life Alan Grant and as in Jurassic Park provides the technical knowledge to the rest of us as we stagger to the rescue boats. He has reviewed many of the pages and has corrected errors but has not yet had a chance to review all our postings. A common problem with many of the older sources available in hard copy is that they have become dated. There have been so many new discoveries recently and revised interpretations of older finds it is hard to keep up. It is not always possible to vet all our information or to include every point of view. Some of the original pages are now looking dated and the intention is to revise them while continuing to add new material. Anthony Beeson is our European representative. A distinguished archeologist and scholar much like a British Indiana Jones, when Anthony is not finding and digging up lost Roman cities he keeps us up to date on dinosaur toys in the old country. We have had other valuable contributors that have helped with information and pictures. You will see them credited on the pages they helped with. We have been fortunate to have assistance from the Safari, Bullyland, PlayMobil, and Procom/Endless Games companies among others in preparing articles and providing samples of their new releases. The Dinosaur Farm, Healthstones and Mike Evans Alchemy Works have been very generous with material donations and information. We hope visitors enjoy the diorama scenes and that they also find the site useful as a reference tool. We have tried to organize the data about toy series in the Company page and while we don't try to compete with the more academic sites on the web, we hope the paleontology information is both of interest and helpful. 9/31/04 - used all the bandwidth for one month up a day before the end of the month. Someone must like us. We are regularly breaking 400 unique hits a day so I assume someone is interested. Click on the Site A icon left for more diorama listed by location Click on the Site A icon to the right for Dioramas organized by period or by manufacturer.